PatternEx ThreatEx Labs features timely and actionable insights from world-class security researchers with AI expertise. Readers will enhance their skill sets with tools and knowledge to efficiently leverage AI for information security. The first entry in a series to introduce the PatternEx ThreatEx Labs Domain Detection Initiative (aka finding malicious domains before anyone else!). has grown into a broad and ambitious project. We think this will appeal to anyone interested in the intersection of cybersecurity and AI, from hard-core security profiles to AI experts. If that resonates with you, we bet you will enjoy this series! As part of this initiative, we will provide a daily feed of malicious domains, release labeled datasets, explain open-source ML projects for domain detection, and propose a series of challenges to the community. But before we jump into details, we wanted to provide a quick idea of what motivated us to start the project in the first place. Why domain detection—doesn’t everyone do this? From a research perspective, using ML to detect malicious domains is not uncharted territory (check out this survey to know more). At the same time, most organizations have solutions in place to block malicious domains based on threat intelligence feeds, which in turn leverage ML to identify IoCs. All that is good but... the fact is malicious domains are still slipping through the cracks. Many of these domains are reported as malicious on VirusTotal. The scan dates show that some of these domains were investigated some five months ago (2018-05-25), while others have been recently scanned (2018-10-03); this indicates the domains are likely to be active. Given that we saw a large number of such domains, we started to think that the generation and registration of these domains would have to be performed in an automated manner on an ongoing basis and that, as a consequence, the generated domains exhibit distinctive patterns that can be leveraged for automated identification. This means that, to complement blacklists, we can use machine learning models trained with examples of malicious and benign domains to detect new malicious domains. Moreover, it is our opinion that the only way to counter large scale malicious infrastructure such as the one behind these domains is to automate the detection process. This way, we set ourselves us to develop a machine learning model to detect these domains, and verify whether we could detect malicious domains missed by existing blacklists. These domains, although similar to the ones shown above, have not been reported on VirusTotal as of the date of this writing (2018-10-10). There is even a case where the exact same SLD (bestcenterplace4streams) is reported by 8/68 solutions under .stream but shows as clean under .review. In the other cases, small variations of the SLDs reveal enough to bypass detection. Schematic representation of the domain detection initiative. We continuously retrieve and analyze live data sources to detect unreported malicious domains. The ins and outs of this project are too much content for a single blog post, so we will be describing the resulting domain feed, datasets, code, and acquired insights in a series of blogs to come. If you have any ideas, comments, or feedback you want to share with us please don’t hesitate to get in touch with us at threatex@patternex.com. Python-based application that uses supervised machine learning to rapidly detect phishing sites from the Certificate Transparency log network. 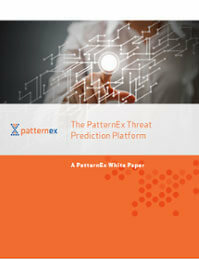 Learn how PatternEx dynamically accepts security analysts feedback to create predictive models that continuously adapt to detect new and existing threats. Using this feedback PatternEx is continuously trained to improve detection accuracy. Download the white paper to learn more.